Just a few days ago, I was sent a hot-off-the-press copy of Sled’Diction 5 from High Country Octane. At 40 minutes and change, I felt like I got the chance to get to know Caleb, Joe, Chris, and the crew, and their journey through the 2014-15 season. It’s no secret, the sled film world has tiers. At the top, are the crews with money and decades of filming/editing experience: Thunderstruck, 509, Slednecks, and Boondockers. However, landing firmly at the top of the second tier, is this year’s film from HCO. Lacking, are the top tier shots you’d expect from a big budget film, like helicopter footage, expensive plug-in or custom editing. However, present, is great filming, a more personal connection with the riders, and a solid riding performance from the team at HCO! This film is a great blend of chutes, powder, tech-lines, and big air from a pretty talented lineup of up-and-coming stars! Starring: Tony Ryan, Caleb Kesterke, Joe Gill, Luke Stovner, Mitch Lesbo, Nicole Sullivan, Mike Souther, Mike Dorning, Chris Case, and many more! This is a great film! For me, I think it’s unfair that I have to rate it against the big budget films, because it’s got such great content and filming. However, like I said above, it’s missing some of the ‘professional’ touches like rigging for the camera, helicopter shots, and some of the newest technology in editing, and that’s really where it loses a star. That being said, don’t think this film is just a crew of buddies that doesn’t know what they’re doing. There’s a great mix of time lapse, slow-motion, unique angles, and editing effects that put this film firmly in the second of my four tiers of film categories. And, after last year’s win at SledFilm, these guys are on their way to the top. In this film, you are invited into the world of Tony Ryan, Caleb Kesterke, Joe Gill, Luke Stovner, Mitch Lesbo, Nicole Sullivan, Mike Souther, Mike Dorning, Chris Case, and many more. You feel like you’ve spent the day riding with a group of your buddies, tearing up the back country. There is a personal connection, for me, and I feel like part of the team. The joking around, getting stuck, and razzing your buddies, this film has a perfect balance of it. And, I’m a big fan of the older sleds that make a few appearances. 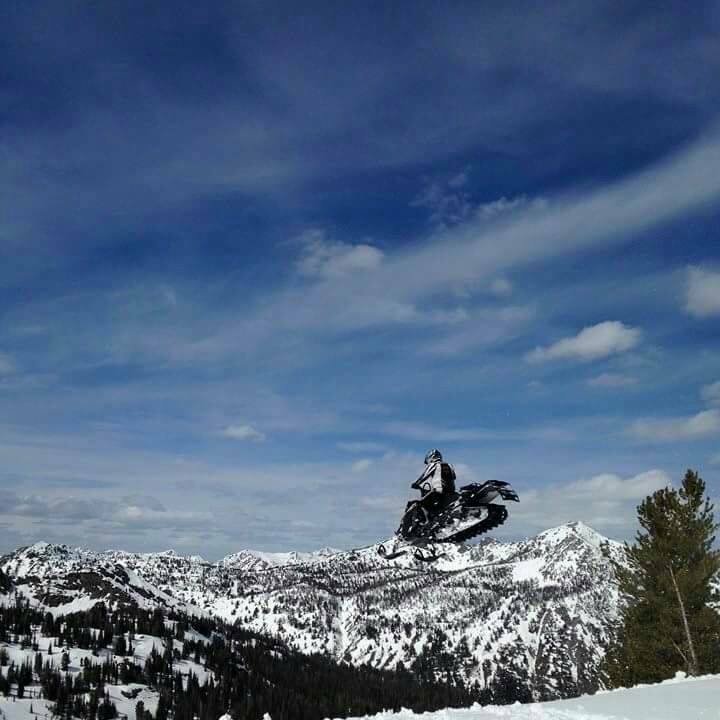 It’s a throwback, for me, to when I started riding the mountains. The terrain is also very impressive. It’s awesome to see a group of guys put together the effort to hit up, everything from Alpine, WY to Elko, NV, Seeley Lake, and more! And, for the way last season panned out, for snow, there’s a lot of great powder shots, abeit, some of the best snow had pretty flat light, but you can’t win ’em all! What I really liked: First, I LOVE a film where, after watching it, I feel like I was actually there; especially at this time of year! I want to feel like I know the crew and could walk up to any of them and carry on a conversation. Second, the music; and you can’t say how much music does for a film. Third, the riding and riders. There were a lot of gnarly tech lines that really drew me in and made me excited to watch. And, I really enjoy watching Caleb Kesterke ride He’s not the only one that steals the show in this film, however, his appearance brings just more credibility to this film as a professional product. Chris Case, Tony Ryan, and Colton Green also stand out with some pretty impressive skills. I’m excited to watch their progression into the next film. What the film needs to head towards the next level: First, it needs a little work on the titling. The Hollywood cinematic start to a movie can really help sell and hook an audience. I’m not a huge fan of some of the color-change chroma-keying, and I think it really needs some 3D rendering on the text, instead of flattened layers. Next, it’s missing some of the ‘trick’ shots that come from the ‘big boys’. Just a couple of shots with some motorized rigging, or even with a drone would really add that next dimension. Finally, I think a little bit of post-processing to help even out some of the levels and keying might help push it over the top. But, all in, that’s a pretty short list. Good job, and Kudos to the HCO team! I’m really looking forward to next year’s film. this the best film footage in the biz! HCO’s got it goin on and the fun funatics and wild riding keep it awesome, hilarious, and kicka$$!